Fat Olives is a wood-fired pizzeria and Italian kitchen in Flagstaff, Arizona, that serves authentic Italian dishes like those found in Naples. While it’s called a pizzeria, the menu has a complete Italian food offering. The open kitchen pays homage to the wood-fired oven handcrafted in Italy by the Valoriani family. The 700-degree oven bakes pizza to perfection in 90 seconds, so your meal comes out quickly. 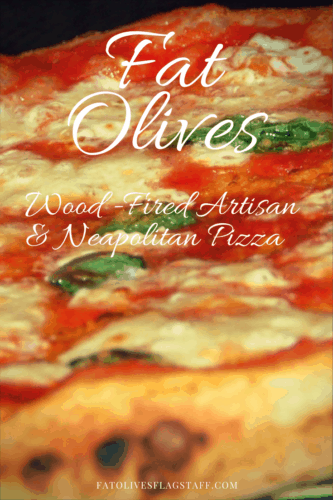 Menu: Fat Olives serves Verace Pizza Napoletana (VPN) certified (true Neapolitan) thin-crust pizza. Each pizza component, the crust, tomato sauce, cheese, and toppings, is special. The crust is made from , which is a fine, grind resulting in a moist dough and crisp crust. The dough contains only four ingredients: flour, yeast, salt, and water and proofs for a full 24 hours. The sauce is house made from imported crushed Italian San Marzano tomatoes. San Marzano tomatoes have fewer seeds and a thicker flesh than other tomatoes. Overall, the taste is sweeter and less acidic. The is hand-made, daily, handcrafted from fresh curd. The result is a creamy white cheese, rather than the light yellow firm “part skim, low moisture” mozzarella. There’s none of that on any of their pizzas. Fat Olives is part of the “slow food” movement, so the toppings they use are local produce when available. They are a part of the Flagstaff Community Market, developing relationships with local farms such as Whipstone Farms, Rabbit Run, Wong’s, and Crooked Sky Farms so that they can use fresh organic produce. Thoughts: There’s a casual family-friendly neighborhood vibe, with exposed brick walls and a variety of seating including an enclosed patio. The name Fat Olive resulted when the chef-owner John Conley’s son said their catering pizza oven reminded him of a fat olive. Conley is an award-winning chef. The roasted tomato bruschetta board which starts with four slices of house-baked country bread. Pesto tops the bread, then house-made mozzarella and oven-roasted tomatoes. There’s a final sprinkle of fresh chiffonade, , , and a drizzle of . The wood-fired lasagna made from imported is layered with a ragu, and mozzarella, all house made and Grana Padano. More thick sauce tops the layered dish, and it’s finished with melted mozzarella. The pizza starts with Italian sausage and then fennel and other spices are added in-house. Fat Olives’ thick tomato sauce, mozzarella, pecorino, and caramelized wood-roasted onions compose the dish. The is ladyfingers soaked in , layered with and a sprinkling of . Each serving is built in a clear individual dish so that you can see the layers. Read more Fat Olives reviews here. Price range: Our lunch for two was about $30 including tax and tip. Lunch entrees range from $10 for a lasagna lunch that includes a salad to around $9.50 for a pizza that serves two. Hours: Fat Olives is open Sunday through Thursday 11:00 am to 9:00 pm and Friday and Saturday 11:00 am to 10:00 pm. Reservations are available. If you’re traveling to Flagstaff, you can find booking information and hotel recommendations here.